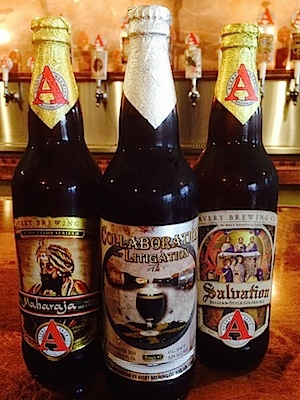 Avery Brewery opened in Boulder, Colorado in 1993 and seems to grow exponentially every year. Avery is known for brewing strong beers: both in terms of hops and alcohol. The number of different brews this brewery turns out is dizzying. Avery has been really involved in community, sponsoring cycling, running events, etc. Avery has broken ground on a new facility that is said to be 100,000 sq ft, including a 249-seat restaurant! Request to discuss/explain a license from the OSI-approved list each episode; we’ll try to add that as of the next one! Collaboration not Litigation Ale – check out the story about how this Belgian-style Ale got it’s name, appropriate in several ways! Samael’s – Oak-aged, English-style ale with lots of carmel and butterscotch flavor. At a whopping 14.2% ABV, it is available in the spring in 12oz bottles that can be cellared for up to 10 years. Part of the Demon Ale series. Salvation – Belgian golden ale at 9.0% ABV; light but BIG. available year-round in 22oz bombers. One of the Holy Trinity series. heavier in hops than the Collaboration, very “Boulder” and delicious! Maharaja – Imperial IPA, very hoppy and strong (surprise!) at 10-12% ABV. Part of the Dictator Series released in January in 22oz bombers. This entry was posted in SPDX, virtual machines and tagged Bitnami, Turn-key Linux. Bookmark the permalink.